The Heritage Gold Mine Park is a National Historic Registry site, therefore, digging and damage to the property are prohibited by law. 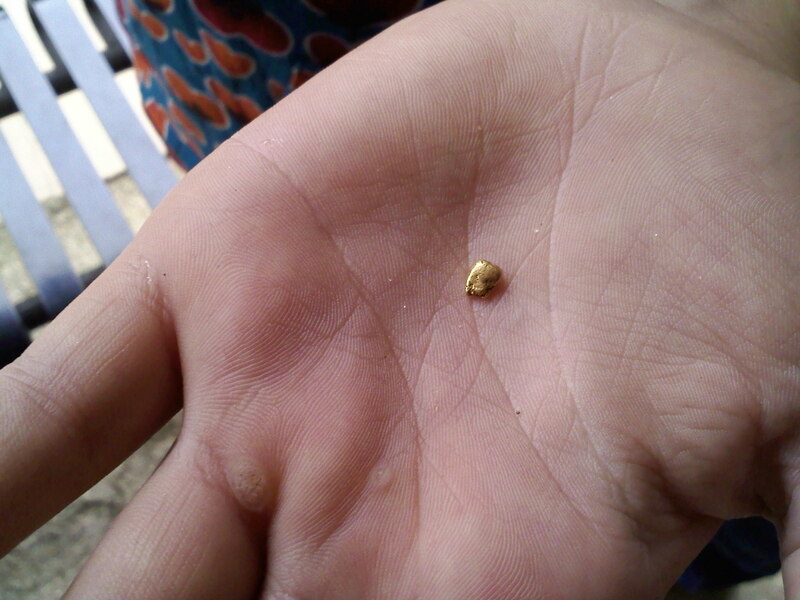 The gold ore at the Heritage Gold Mine Park is natural gold from a creek in the Lincolnton, GA area. It is coarse gold and easy for beginners to pan if they have reasonably good technique. Buckets of crushed rock can be purchased and panned out at the covered panning trough, or they can be taken home for new prospectors to practice the techniques. Keep whatever you find and we can put it into a small vial of water to show your friends back home. Once you get comfortable with the technique, you should be able to pan a bucket in about a half hour or less. 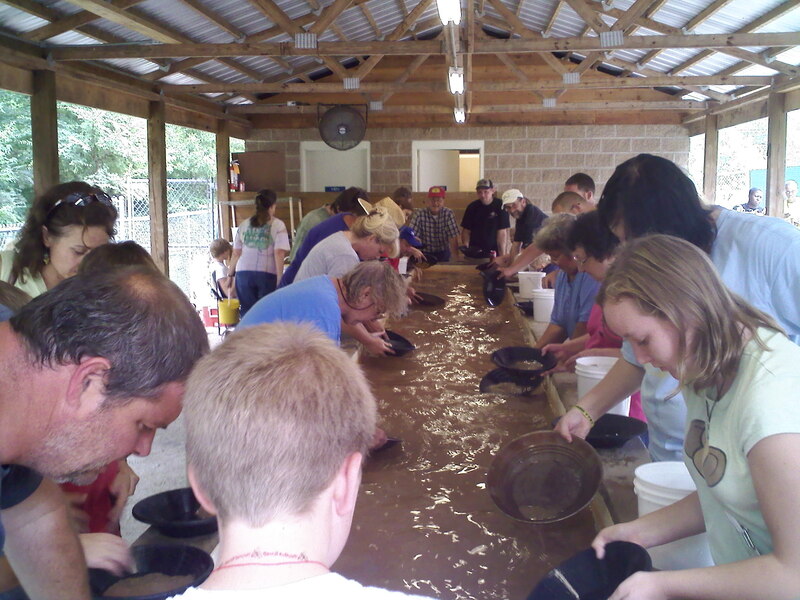 We strongly recommend that gold panning be limited to children 7 or older and that they have a reasonable degree of patience and ability to learn the techniques. Gold is thoroughly distributed through the crushed rock, therefore, sharing a bucket is reasonable. Half gallon bucket(you should be able to find 4-8 pieces per bucket): $5 including tax. Panning instructions are available at no charge from our knowledgeable staff. The gemstones in our crushed rock come from gem dealers. Some are raw rocks, right out of the ground, some are chips from a crushing operation, some are chips from gemstone cutting, and some have been polished in a tumbling operation. No two buckets will be alike. Buckets of gemstones can be purchased and cleaned up at the covered panning trough. Keep whatever you find and we can help you identify your gems. 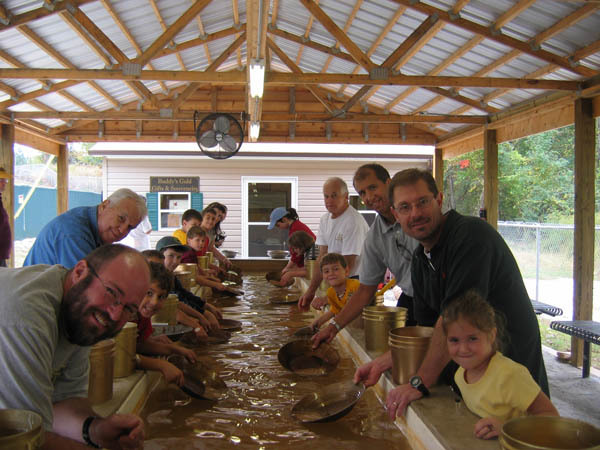 Gemstones are particularly interesting for the smaller children and anyone else that does not have the patience required for the gold panning. 1 gallon short-filled bucket: $5 including tax. There may be times when gemstone material is not available for screening. Because the size of the stones interferes with thorough mixing into the sand, we strongly discourage the sharing of gem buckets (the fastest child will get most of the best stones).